Summer has really hit its stride. It’s hot here now—so hot that the fog is gone by the time we start harvest at 7 a.m., hot enough that I have to drag the flimsy bags full of wilting supermarket produce into the shade to sort for composting (and if you know me, you know that any contact I have with rotting vegetables is kept to a minimum). The strange thing about realizing that summer is in full swing is that by the time you realize it, it’s invariably almost September. This time of year has always meant getting ready to go back to school, but now for the first time since I can remember the only significant change next month will bring will be closing up the chicken coop at 8 p.m. instead of 9 p.m. Still, it’s been a very memorable past few months, and in the tradition of list-making, here are a few things that will always remind me of summer 2011. Dahlias. 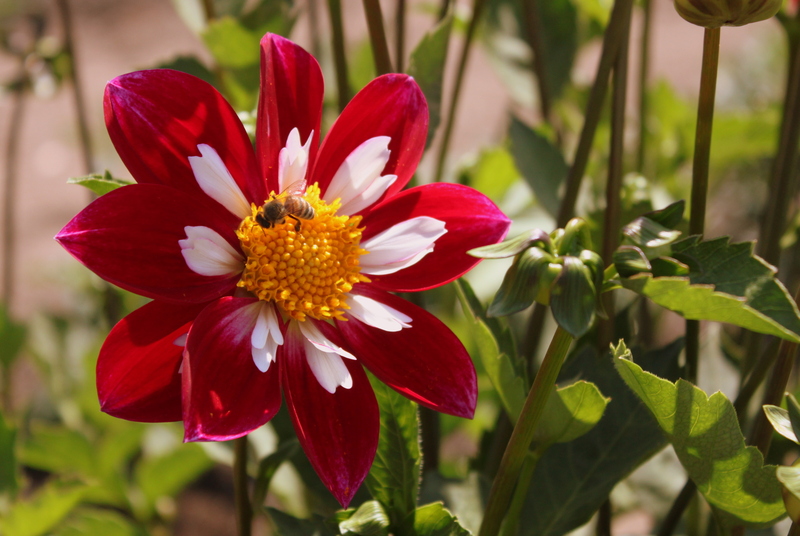 Those dahlia catalogs your aunt has where the flowers look as though they can’t possibly be real? They are. Blackadder. My childhood love for Rowan Atkinson as Mr. Bean (“Birdie num-nums!”) has been very much revived. Two-Buck Chuck. After tasting all the lovely $1.99 varieties alongside weeknight meals, I can safely say the Cab and Pinot Grigio are my favorites. Really, he should be paying me by now. Zucchini cake. Zucchini gratin. Zucchini lasagna. Zucchini fritters. Zucchini sauté. Zucchini cookies… you get the idea. Watering. Three hours a day of watering. (See “mixtapes from Chromemusic”). People sharing a homemade meal. Every so often (ok, almost every day) I glance through the WordPress stats that tell me how people come across my blog, and my favorite was someone finding a photo of us having dinner at the table outside the cottage after searching “people sharing a homemade meal.” It really doesn’t get better than that. Rinse the chard and remove the stalks by folding each leaf and slicing along the stem. Layer several leaves on top of each other and roll together, slicing the roll to create thin slivers. Toss the slivers together in a bowl. To make perfect hard-boiled eggs, heat a saucepan of water to a gentle boil and slowly lower the eggs in. Cook for 11 minutes, then use a strainer to transfer the eggs from the boiling water into a bowl of ice water. Peel each egg under water, then set on a plate and mash with a fork. Season with salt and pepper. Make your dressing by combining the balsamic, mustard, and honey or jam. Whisk in olive oil and season with salt and pepper. 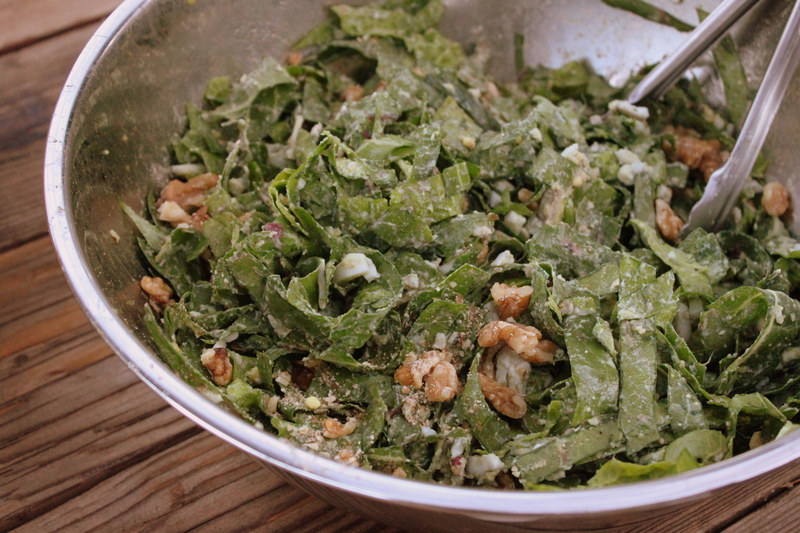 Combine chard, eggs, and walnuts, then toss with dressing and serve. I found you last week by Googling “oatmeal with fried egg.” I love your blog!